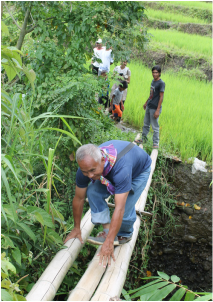 Micro hydro developers' capacities are limited to that of their community organizers because project implementation requires a unified and committed community. Local change agents, trusted by the village, are the key to community-driven project completion and long-term sustainability. Without such local 'patriots', bridging local and external actors, there would be no micro hydro projects. Their process with and understanding of the community are deep-rooted and irreplaceable by external actors. Funding agencies and policy makers often are unaware of the crucial role of local community mobilizers and ways to strengthen them. Local NGOs are aware but have difficulty in retaining and supporting committed local change agents. Green Empowerment will visit and interview micro hydro developers, staff, and community organizers to collaboratively determine how to strengthen and building a network of local change agents for micro hydro programs in southeast Asia. The resulting study will be used by HPNET's People and Environment Working Group to plan immediate and long-term support for community mobilizers. (b) to provide external actors, such as NGOs, funding agencies, and policy makers, a firsthand glimpse to ground realities, seen from local perspectives.